We are a small, but growing, friendly group with varied interests and experience. Monthly evening meetings include talks and/or mini-workshops given by outside speakers, some of whom are well known, others more local but equally good. We meet in St. John’s Church Hall, Auction Close, Ashbourne, DE6 1GQ on the 3rd Monday in the month at 7.30pm but not in August. We include some ‘in-house’ meetings when we share our ideas and expertise on a chosen theme. These meetings are an ideal opportunity to get to know each other and they are always very interesting and rewarding. We meet on the first Monday of each month (but 9th January 2017) at Wyaston Village Hall to stitch, chat and generally share ideas. Everyone is welcome. NB If the first Monday is a BANK HOLIDAY we usually meet the following week - but please check. Occasionally we hold a whole day Saturday workshop, again usually at Wyaston. We welcome visitors and new members whatever their levels of expertise. We celebrated our 20th anniversary at the AGM in September 2018. Click here to see more. We held a successful eco-dyeing workshop tutored by Pam Keeling. To support the National Celebration of Stitch, which in 2018 was on the theme of Hearts, we ran free drop-in Workshops in Ashbourne Library on June 22nd & 29th from 10 – 3pm. They were suitable for all skill levels and all materials were provided for members of the public to join in. 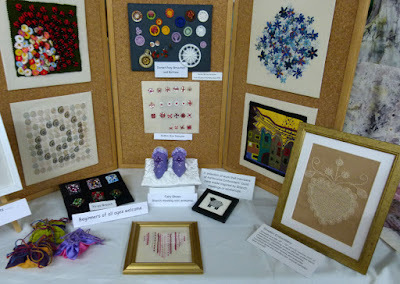 The Guild organised a project for members to make hearts to celebrate the end of World War 1 and exhibited them around the country in groups of 100. Some of our members took part. Christmas baubles ready for the tree. An imagnative contribution to the feast by a member. 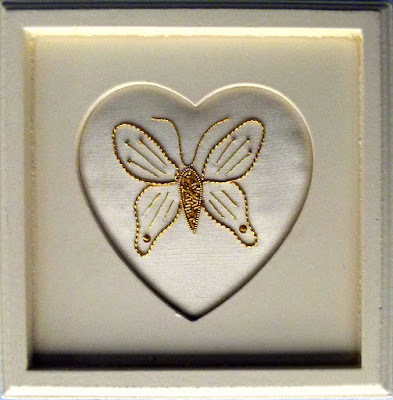 To celebrate the 2017 National Day of Stitch we will be sewing butterflies in the WI tent at the Ashbourne Show on August 19th from 11am. Do come and join us. All materials will be provided if you would like to join in or just come along to look and chat. To celebrate the 2016 National Day of Stitch,we held a 'drop in' sewing event in ASHBOURNE LIBRARY. The tree has been decorated once again in St Oswald's Church and looks very festive with all your stars. We had an enjoyable mini-workshop with Eddie, experimenting with the simple but effective technique of Kantha. The example of Kantha stitching prepared by Eddie for the workshop. Pauline Fitzpatrick, branch member gave us an informative and fascinating look into her world of crochet. We learned a lot about many of the variations of Tunisian crochet and her favourite free form and very colourful crochet. We enjoyed the expertise of Viv Arthur and the resources of Art Van Go at a Saturday workshop. We explored many materials and media which she brought for us to try. Lots of fun, learning and lovely things to buy! Siobhan (Burton) took both 1st and 2nd prize in the 2016 Fire and Flames category at the Quilt and Stitch show at Uttoxeter. Mr Frog, by member Sharon Greaves, will be the star of the show. Our Wyaston Workshop day on October 12th was a great success and attended by many branch members and visitors. Many thanks again for a wonderfully inspiring day - everyone was really buzzing with all you had to show and teach us! We realise what effort and time you all put in to make the day so brilliant. Ruth - we loved your mixed media examples and hope you are feeling rested and improving. Kit - your little felties were gorgeous and much admired as ever - hope things are improving with you too. This very successful and enjoyable day's workshop held in 2013 was run by member Helen King with help from Ruth Broadbent. We enjoyed a fascinating evening as Mary demonstrated her process for making Collograph blocks and prints. Her pleasure in her work and enthusiasm was infectious.